Okay, I wasn’t going to post merely frivolous stuff here, but this is far too precious to pass up. You who preach … well. If you gotta slip up, go big. 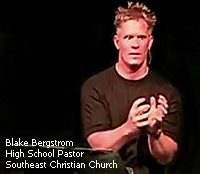 Here’s a clip below of poor high school pastor Blake Bergstrom, who tried to work his way around a bit of a tongue twister as he introduced a sermon that might have already been doomed, based on his unusual use of metaphors. As you listen, just wait. No: the “light ourselves on fire so they can watch us burn” is not the gaffe you are listening for, surprisingly, but that imagery is bad enough that he might actually have improved his sermon with an extreme Freudian slip! All I know to say is…”Thank God for His GRACE!! !” After talking with God about this whole thing, He let me know that when it happened… all of heaven fell to their side, they started beating the ground, with tears streaming down their face, and Lot was running around pinching himself, and all the heavenly hosts roared with laughter…just like you did!!!! You can also watch the short video clip at iFilms if the Windows Media file doesn’t open. Thanks to Adam Cleaveland at pomomusings for the tip. This is PRICELESS! And what a great guy to be able to laugh at himself with the rest of the world. I’d love to have my kids sit in his services. Thanks for the kudos, Steve. There was definitely a nervous titter, several amused grins, and a brief pause as my mentor recollected his thoughts and zippered right back into his message. They say it happens to the best of us. I dearly wish there was an archive of choice sermonic gaffes from the likes of Haddon Robinson, John Piper, Billy Graham. That would be fun to listen to on a long drive to the in-laws! My wife and I haven’t laughed this hard in a month. Thanks for the post. I know blake, and i’ve know him for a little while. I ran into him this past week at Catalyst. Every random person from DC, Ohio, California, Florida starts asking for their picture with him, and to get his autograph. I’m thinking — “what in the world is going on?”. Then, one of the guys there shares with me the video on his laptop — right there. aaahhh… what an experience of community. To be united with other believers in Jesus Christ through the blunders of one. It was great fun for all, and like always — Blake took it very well in stride! Blake is my youth pastor at Southeast Christian and he is so hilarious that I can’t imagine anyone funnier! You might just think of him as a strange guy, and there are stories about hime that will confirm that! He will walk into a fast food restaurant and when he sees the lady at the register who looks upset, he’ll go tell her about the best party ever that he just went to: CHURCH! He does this often enough that we are able to meet those people that he invites. One of them, Edwardo who works at Krispy Kream, brought all of us (hundreds) donuts! After we took offering, Blake handed the basket to Edwardo. Blake is the most loving -kid I know! He likes to call himself God’s favorite coffee mug; he’s the one chosen to do a bunch of stuff for God, and he wants us to be that coffee mug too! I think he’s awesome, and the fact that I was there at the “pitch your tents” service makes it all the more awesome! Now I’ve got his voice in my head again…. You gotta love Anglican humor. No way you can print the trascript? my audio is on the blink. Hey brother what’s going on. You are amazing to listen to You’re kind of funny. You also did fabulous at NYR this year. Awesome dude, So you preach at a church in Parker, Colorado ? Sorry, Jennifer, I am not Blake Bergstrom, and he is not affiliated with this weblog in any way. I only capitalized on his innate sense of humor to drive traffic to my weblog. If you want to contact Blake, try the email address currently listed by his name on the Southeast Christian Center’s website, here. awww. that’s my pastor. and basically my best friend. we always had the best conversations. especially at my church, southeast. and there were always moments when we would cry and laugh together. we had the best convo at CIY, and to make me laugh, he reminded me of this incident. i love blake. and his wife and four daughters! i miss him so much though. i feel so bad that no one will ever let it go that he got a little dyslexic.